In the return of Dominic Queste, his girlfriend Ginty O’Reilly, asks him a favour. She wants him to find her missing cousin, Sam Price, a local butcher who has gone missing. 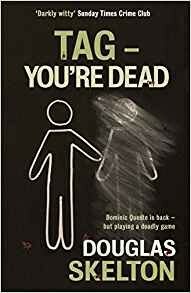 Of course, things are not going to be simple and Queste discovers that Price has underworld connections and he soon comes face to face with Tank Milligan, a most unsavoury character and, worse than that, Fast Freddie Fraser, a brutal gangster. But there is more. Queste is soon targeted by a particularly sadistic and vicious killer. His second outing may well be his last. If he does not do as he is told, his loved ones will suffer. Despite this unfortunate situation, it is not a totally grim novel; there are moments of humour to counter the real horror of the situation. Having said that, be aware that there are some stomach-turning moments. Not too ‘over the top’ but certainly unpleasant. Characters like Donald and Hamish Sutherland and Father Verne from the previous book make another appearance as do Shayleen and Cody, the drug addicts. The story moves along at a good pace and the reader will certainly not be bored. If you enjoyed The Dead Don’t Boogie, you will be satisfied with this.